In the year 2000, for the first time, Pope John Paul II celebrated the “Sunday within the Octave of Easter” as “Divine Mercy Sunday.” The relatively recent devotion to Divine Mercy is inspired by the writings of Sr. Faustina—a Polish nun, whom John Paul canonized. What is “grace”? If you went to Catholic school, you probably learned the definition somewhere along the line that grace is “a participation in the Divine Life.” That’s a good definition, and very true. But I want to share another definition, which comes from the Catechism of the Catholic Church. The Catechism teaches that: “Grace is favor, the free and undeserved help that God gives us” (CCC 1996). Said another way, grace is God giving us something good that we don’t deserve. Now, that definition sheds light for us on what mercy is. If grace is God giving us something good that we don’t deserve, mercy is the converse. Mercy is God NOT giving us something BAD that we DO deserve. All of us are sinners, so all of us deserve punishment—even death. But God, in His mercy, doesn’t give us the punishment we deserve. Instead of letting us die in our sins, He let His own Son die for our sins. And that is mercy. We have all received many graces from God—favors of the Lord, which we don’t deserve. Perhaps even more stupendously, we have all received God’s mercy. That is to say, we haven’t been punished for our sins as we deserve. Jesus, instead, bore the weight of our guilt. So, mercy, itself, is a grace. 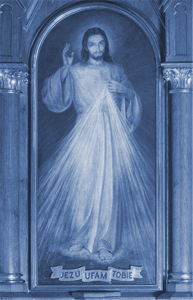 And, as Christ revealed to St. Faustina, mercy is “God’s greatest attribute”!